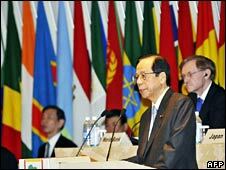 Japan's Prime Minister Yasuo Fukuda has promised to double his country's aid to Africa within five years. Mr Fukuda made the pledge in front of leaders from more than 50 African countries at a conference in the Japanese city of Yokohama. He also called on Africa to work together on measures to try to combat climate change. This is the fourth time Japan has hosted a major conference involving African leaders. It is competing with other countries like China and India for influence on the continent. Japan wants access to Africa's markets and to its natural resources. But it also wants to help. Opening the conference Mr Fukuda pledged that by 2012 Japan would double its aid to Africa, currently $1.7bn (£850m), increasing it gradually year by year to meet the target. That sounds generous, but Japan gives less to the continent than the United States does, and also less than Britain, France and Germany - three countries with smaller economies than Japan. The prime minister promised to encourage Japanese firms to invest there. President Jakaya Kikwete of Tanzania, replying on behalf of the African Union said the Japanese government needed to work much harder to persuade businessmen that Africa was a safe place to invest. "The perceived notion of risks about doing business with Africa or in Africa today is more a matter of the unforgotten past history than what is actually occurring on the ground in Africa today," he said. The president also welcomed the pledge of more aid and called on the prime minister to urge his fellow leaders from the G8 group of leading economies to honour their commitments to Africa. For the next three days the conference will debate how to turn the rhetoric of the opening speeches into practical measures.